Over the last several months I have been running hundreds of jobs on various small scale Hadoop clusters. I have compiled the results, come up with some conclusions, and will have more details posted here. If you have time available, on Tuesday Sept 11, you can get a sneak peek of the testing in a webinar (registration required) on big data and capital markets here. In 2008 I was on a panel at WinHEC alongside other SSD and disk industry participants. The question came up – When would SSDs become the default option rather than a premium? Most answers came in a form of – there are places where both disks and SSDs make sense. When my opportunity to comment came, I replied simply “five to ten years,” which added a bit of levity to the panel where the question had been skirted. Now that several years have passed, I can look back at how the industry has moved forward and I decided that I was ready to update my prediction. In a part of the market there is an unrelenting demand for additional capacity. There are enough applications where capacity beats out the gains in performance, form factor, and power consumption that come with SSDs to give products that optimize price per capacity a bright future. With disk manufacture’s single focus on optimizing cost per capacity, performance optimization has been left to SSDs. In applications that support business processes where performance and capacity are both important, this is a profound shift that has really only begun. SSDs are not going to replace disks wholesale, but using some SSD capacity will become the norm. One of the aspects of a market that moves from niche to mainstream is that the focus has to shift towards designing for mass markets with a focus on price points and ease-of-use. After looking at the market directions I reached the following conclusion: the biggest winners will be the companies that make it easiest to effective use SSD across the widest range of applications. I conducted a wide survey of the SSD industry, weighed some personal factors, and moved from Texas to Colorado to join LSI in the Accelerated Solutions Division. Today LSI announced an application acceleration product family that fully embraces the vision of enabling the broadest number of applications to benefit from solid state technology, from DAS to SAN, to 100% flash solutions. The problems that SSDs solve and the way that they solve them (eliminating the time that is spent waiting on disks) has not really changed, but the capacity and entry level prices points have, allowing for much broader adoption. Using SSDs still requires sophisticated flash management (which is still highly variable from SSD to SSD), data protection from component failures, and integration to use the SSD capacity effectively with existing storage – so there is still plenty of room to add value to the raw flash. In the next wave of flash adoptions, expect to see a much higher attach rate of SSDs to servers. A shift is taking place from trying to explain why SSDs would be justified, to explaining why SSDs are not justified. In this next phase reducing the friction to enable deployment of flash far and wide is the key. In 2008 Sun Microsystems announced the availability of a feature in ZFS that could use SSDs as a read or write cache to accelerate ZFS. A good write-up on the implementation of the level 2 adaptive read cache (L2ARC) by a member of the fishworks team is available here. In 2008, flash SSDs were just starting to penetrate the enterprise storage market and this cache was written with many of early flash SSD issues in mind. First, it warms quite slowly, defaulting to a maximum setting of 8 MB/s cache load rate. Second, to avoid being in a write heavy path, it is explicitly set outside of the data eviction path from the ZFS memory cache (ARC). This prevents it from behaving like a traditional level 2 cache and causes it fill more slowly with mainly static data. Finally, the default record size of the file system is rather big (128KB) and the default assumption is that for sequential scans it is better to just read from the disk and skip the SSD cache. Change the Record Size to a much lower value than 128 KB. The L2ARC fetches the full record on a read and 128 KB IO size to an SSD uses up device bandwidth increases the response time. Change the l2arc_write_max to a higher value. Most SSDs specify a device life in terms of full device write cycles per day. For instance, say you have 700 GBs of SSDs that support 10 device cycles per day for 5 years. This equates to a max write rate of 7000 GBs/day or 83 MB/s. As the setting is the maximum write rate, I would suggest at least doubling the speced drive max rate. As the L2ARC is a read only cache that can abruptly fail without impacting the file system availability, the risk of too high of a write rate is only that of wearing out the drive ealier. This throttle was put in place as when early SSDs with unsophisticated controllers were the norm. Early SSDs could experience significant performance problems during writes that would limit the performance of the reads the cache was meant to accelerate. Modern enterprise SSDs are orders of magnitude better at handling writes so this is not a major concern. Set the l2arc_noprefetch=0. By default this is set to one, skipping the L2ARC for prefetch reads that are used for sequential reading. The idea here is that the disks are good at sequential so just read from them. With PCIe SSDs readily available with multiple GB/s of bandwidth even sequential workloads can get a significant performance boost. Changing this parameter will put the L2ARC in the prefetch read path and can make a big difference for workloads that have a sequential component. I recently joined the governing board of SNIA’s Solid State Storage Initiative (SSSI), an organization designed to promote solid state storage and standards around the technology. One of the biggest points of contention in the SSD space is comparing various devices’ performance claims. The reason this is fairly contentious is that test parameters can have a dramatic impact on the achievable performance. Different flash controllers have been implemented in ways where the amount of over provisioning (see my post on this), the compressibility of the data, and how full the device is can have a dramatic performance impact. To help standardize the testing process and methodology for SSDs the SSSI developed the Performance Test Specification (PTS). This specification outlines the requirements for a test tool and defines the methodologies to use to test an SSD and the data the needs to be reported. The SSSI is actively working to promote this standard. One of the hurdles to adoption is that many vendors are using their own testing methodology and tools internally and don’t want to modify their processes. There is also hesitation to present numbers that don’t have the best case assumptions that may be compared to the competition under different circumstances. This can make life more difficult for end users, as there is a gap between having a specification and having an easy way to run the test. I spent some time over the past week making a bash script that uses the Flexible I/O utility (you will need to download this utility to use the script) to implement my reading of the IOPS section of the test. I also made an Excel template to paste the results from the script into. You can use this to select the right measurement window and create an IOPS chart for various block sizes. There are still a few parameters that you need to edit in the script and you will have to do some manual editing of the charts to meet the reporting requirements, but I hope that this will help as a starting point for users that want to get an idea of what the spec does and run tests according to its methodology. #check to see if right number of parameters. echo "Usage: $0 /dev/<device to test>"
#The output from a test run is placed in the ./results folder. #This folder is recreated after every run. echo "Running on SSSI PTS 1.0 Section 7 - IOPS on device: $1"
echo "****Prior to running the test, Purge the SSS to be in compliance with PTS 1.0"
#To test the full device use fdisk -l to get the device size and update the values below. echo "Test range 0 to $SIZE"
echo "OIO/thread = $OIO, Threads = $THREADS"
echo "Test Start time: `date`"
#Write 2x device user capacity with 128 KiB sequential writes. echo "Pass, BS, %R, IOPS" >> "results/datapoints.csv"
echo "Pass, BS, %R, IOPS, Time"
echo "$PASS, $i, $j, $IOPS, `date`"
echo "$PASS, $i, $j, $IOPS"  >> "results/datapoints.csv"
Is There Room for Solid State Disks in the Hadoop Framework? The MapReduce framework developed by Google has led to a revolution in computing. This revolution has accelerated as the open source Apache Hadoop framework has become widely deployed. The Hadoop framework includes important elements that leverage hardware layout, new recovery models, and help developers easily write parallel programs. A big part of the framework is a distributed parallel file system (HDFS) that uses local commodity disks to keep the data close to the processing, offers lots of managed capacity, and triple mirrors for redundancy. One of the big efficiencies in Hadoop for “Big Data” style workloads is that it moves the process to the data rather than the data to the process. Knowledge and use of the storage layout is part of the framework that makes it effective. On the surface, this is not an environment that screams for SSDs due to the focus on effectively leveraging commodity disks. Some of the concepts of the framework can be applied to other areas that impact SSDs. However, one of the major impacts of Hadoop is that it enables software developers without a background in parallel programming to write highly parallel applications that can process large datasets with ease. This aspect of Hadoop is very important and I wanted to see if there was a place for SSDs in production Hadoop installations. I worked with some partners and ran through a few workloads in the lab to get a better understanding of the storage workload and see where SSDs can fit in. I still have a lot of work to do on this but I am ready to draw a few conclusions. First, I’ll attempt to describe how Hadoop uses storage using a minimum of technical Hadoop terminology. There is one part of the framework that is critical to understand: All input data is interpreted in a <key, value> form. The framework is very flexible in what these can be – for instance, one can be an array – but this format is required. Some common examples of <key, value> pairs are <word, frequency>, <word, location>, and <sources web address, destination web address>. These example <key, value> pairs are very useful in searching and indexing. More complex implementations can use the output of one MapReduce run as the input to additional runs. Map: Input data is broken into shards and placed on the local disks of many machines. In the Map phase this data is processed into an intermediate state (the data is “Mapped”) on a cluster of machines, each of which is working only on its shard of the data. Doing this allows the input data in this phase to be fetched from local disks. Limiting what you can do to only local operations on a piece of the data within a local machine allows Hadoop to turn simple functional code into a massively parallel operation. The intermediate data can be bigger or smaller than the input, and it is sorted locally and grouped by key. The intermediate data sorts that are too large to fit in memory take place on local disk (outside of the parallel file system). Reduce: In this phase the data from all the different map processes are passed over the network to the reduce process that has been assigned to work on a particular key. Many reduce process run in parallel, each on separate keys. Each reduce process runs through all of the values associated with the key and outputs a final value. This output is placed locally in the parallel distributed file system. Since the output of one map-reduce run is often the input to a second one this pre-shards the input data to subsequent map-reduce passes. Streaming the data in from local disk to the local processor. Sorting on a temporary space when the intermediate data is too large to sort in memory. Moving the smaller chunks of data across the network to be grouped by key for processing. Streaming the output data to local disk. There are two places that SSDs can plug into this framework easily and a third place that SSDs and non-commodity servers can be used to tackle certain problems more effectively. Using SSDs for storage within the parallel distributed file system. SSDs can be used to deliver a lower cost per MB/s than disks (this is highly manufacture design dependent), although the SSD has a higher cost per MB. For workloads where the dataset is small and processing time requirements are high, SSDs can be used in place of disks. Right now with most Hadoop problems focusing on large data sets, I don’t expect this to be the normal deployment, but this will grow as the price per MB difference between SSDs and HDDs compresses. Using SSDs for the temporary space. The temporary space is used for sorting that is I/O intensive, and it is also accessed randomly as the reduce processes fetch the data for the keys that they need to work with. This in an obvious place for SSDs as it can be much smaller than the disks used for the distributed file system, and bigger than the memory in each node. If the jobs that are running result in lots of disk sorts, using SSDs here makes sense. The key here is that “Network Bandwidth” is scarce because the number of nodes in the cluster is large. This inherently limits the network performance due to cost concerns. The CPU resources are actually quite cheap in commodity servers. So this setup works well with many workloads that are CPU intensive but where the intermediate data that needs to be passed around is small. However, this is really an attribute of the cluster setup more than of the Hadoop framework itself. Rather than using commodity machines you can use a more limited number of larger nodes in the cluster and a high performance network. Instead of using lots of 1 CPU machines with GigE networking, you can use quad socket servers with many cores and QDR Infiniband. With 4x the CPU resources and 40x the node to node bandwidth, you now have a cluster that is geared towards jobs that require lots of intermediate data sharing. You also now need the local storage to be much faster to keep the processors busy. High bandwidth/high capacity enterprise SSDs, particularly PCIe SSDs, fit well into this framework as you want to have higher local storage bandwidth than node-to-node. This is in effect a smaller cluster of “fat” nodes. The processing power in this setup is more expensive, so this isn’t the best setup for CPU intensive jobs. Hadoop is a powerful framework. One of its key advantages is that it enables highly parallel programs to be written by software engineers without a background in computer science. This is one reason it has grown so popular and why it is important for hardware vendors to see where they fit in. There is a lot of flexibility in the hardware layout, and different cluster configurations make sense for tackling different types of problems. Where Does Data Management Software Belong? It is interesting to see how some of the developments in the IT space are governed by intradepartmental realities. I see this most pronounced in the storage team’s perspective versus the rest of the IT team. Storage teams are exceptionally conservative by nature. This makes perfect sense – servers can be rebooted, applications can be reinstalled, hardware can be replaced – but if data is lost there are no easy solutions. Application teams are aware of the risk of data loss, but are much more concerned with the day-to-day realities of managing an application – providing a valuable service, adding new features, and scaling performance. This difference in focus can lead to very real differences in viewpoints and a bit of mutual distrust between the application and storage teams. The best example of this difference is where the storage team classifies storage array controllers as hardware solutions, when in reality most are just a predefined server configuration running data management software with disk shelves attached. Although the features provided by the controllers are important (like replication, deduplication, snapshot, file services, backup, etc.) they are inherently just software packages. More and more of the major enterprise applications are now building in the same feature set traditionally found in the storage domain. With Oracle there is RMAN for backups, ASM for storage management, Data Guard for replication, and the Flash Recovery Area for snapshots. 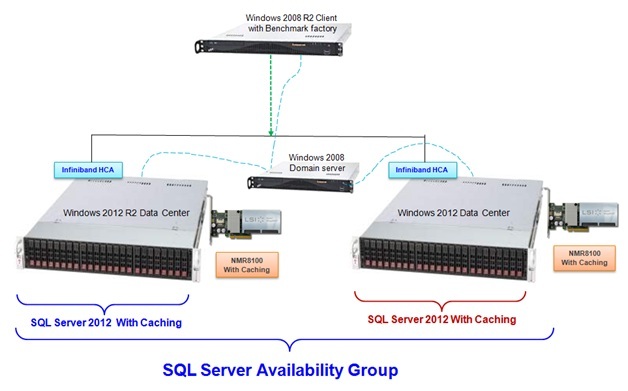 In Microsoft SQL Server there is database mirroring for synchronous or asynchronous replication and database snapshots. If you follow VMware’s updates, it is easy to see they are rapidly folding in more storage features with every release (as an aside, one of the amazing successes of VMware is in making managing software feel like managing hardware). Since solutions at the application level can be aware of the layout of the data, some of these features can be implemented much more efficiently. A prime example is replication, where database level replication tools tie into the transaction logging mechanism and send only the logs rather than blindly replicating all of the data. The biggest hurdle that I have seen at customer sites looking to leverage these application level storage features is the resistance from the storage team in ceding control, either due to lack of confidence in the application team’s ability to manage data, internal requirements, or turf protection. One of the most surprising reasons I have seen PCIe SSD solutions selected by application architects is to avoid even having these internal discussions! As the applications that support important business processes continue to grow in their data management sophistication there will be more discussions on where the data management and protection belong. Should they be bundled with the storage media? Bundled within the application? Or should they be purchased as separate software – perhaps as virtual appliances? Where do you think these services will be located going forward? Let me know below in the comments.